Ever wonder what living under Soviet communism did to the Russian soul? Well here is a nesting doll that depicts the transformation. The innermost piece is a happy, traditional, innocent matryoshka girl. The middle "maiden" is a serious Soviet woman bearing a hammer and sickle. Consternation on her brow reveals the honeymoon with utopian dreams is over. 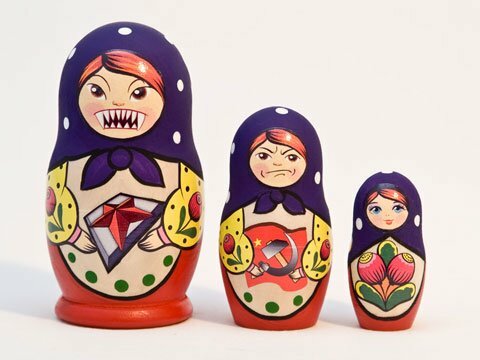 Finally, the largest doll is a vampire matryoshka, symbolic of the Soviet state. Wouldn't George Orwell approve?